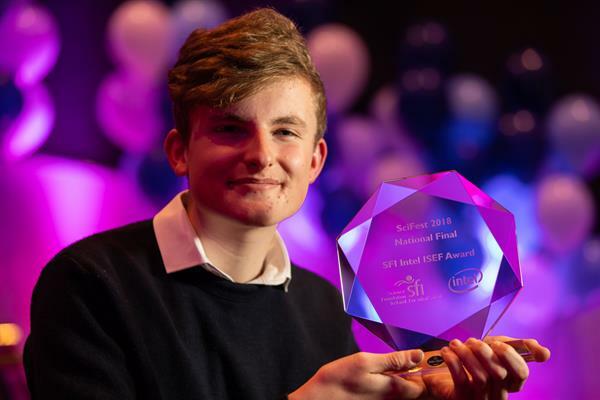 Friday 9th November – Adam Kelly, a fifth year student from Skerries Community College was this afternoon named the overall winner at SciFest 2018, for his open source solution to stimulating quantum computing and will go on to represent Ireland at the Intel International Science and Engineering Fair in Phoenix, Arizona next year. Funded primarily by Science Foundation Ireland (SFI), Boston Scientific and Intel Ireland, SciFest is an all-island STEM (science, technology, engineering and maths) initiative which fosters active, collaborative and inquiry-based learning among second level students. The final, held in Marino Conference Centre in Dublin today, was attended by Richard Bruton T.D., Minister for Communications, Climate Action and Environment. Adam was presented with the SciFest 2018 SFI Intel ISEF Award by Margie McCarthy, Interim Director, Innovation and Education Directorate, SFI . 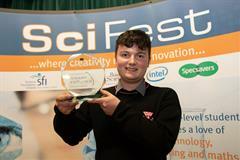 Adam secured his place at the National Final after his victory at the SciFest regional final at the Institute of Technology Blanchardstown. Large scale quantum computers are not yet widely available, this means the development of quantum computers and algorithms requires fast, accurate stimulations. Adam developed just that, an open source solution to quantum computing which was up to 15 times faster than conventional stimulators. His solution can be used by anyone in their own experiments with ease. This software has direct applications in the verification of quantum devices, quantum algorithm design and investigations of quantum supremacy. This year saw over 10,000 students participating in local and regional SciFest STEM fairs across the country. Since its inception in 2008, over 60,000 students have participated in the competition, reflecting a year-on-year increase of 23% in participation. 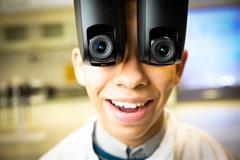 Adam was one of 64 students who went on to exhibit 37 STEM projects at the national final. This year’s SciFest also saw the introduction of the Broadcom Masters Award. This new award saw five junior cycle students, ranging in age from 12 to 14, compete for the opportunity to participate in the Broadcom MASTERS programme which includes attendance at the Intel International Science and Engineering Fair next year. The inaugural award was won by year old Éabha Kenny, from Scoil Muire gan Smál, Convent of Mercy, Roscommon Town, Roscommon. 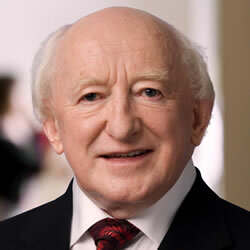 Eabha will be one of 28 delegates representing 25 countries. Sheila Porter, SciFest Founder and CEO, said: “It is fantastic to see the level of talent, enthusiasm and determination on display today from the students. SciFest gives students of all abilities and backgrounds the opportunity to develop their research, problem solving, critical thinking and presentation skills. We take pride in creating the biggest, most inclusive student science event possible. This year we are excited to introduce the Broadcom MASTERS Award for junior cycle students where the winner will have the opportunity to attend the Intel International Science and Engineering Fair. This is a fantastic opportunity for young students with a budding interest in STEM. Leo Camacho who won the SciFest Scientist of the Future Award for his project on making social media a better place using artificial intelligence. Nicole Marinos who won the Boston Scientific Medical Devices Grand Award for her project on visual communication device to promote patient participation and wellness during magnetic resonance imaging. Darragh Fleming, Ethan O’Neil and Colm Looney who won the SciFest STEM Outreach Award for their project on deer watching. Emma Kelly & Brian Conlon who won the Abbott Ireland Life Sciences Award for their project on Ireland’s burning problem: a study of the ecological impact of Irish gorse fires. Tony O’Halloran & Aidan Mamo Cooney who won the THEA (Technological Higher Education Association) Award for their project: applications of queuing theory to the child and adolescent mental health services in Ireland. Conn Caomhánach & Con Ó Meachair who won the Irish Science Teachers Association Award for their project investigating the biological benefits of EM probiotics in agriculture.